Companies can increase their profitability 20–50% or more through careful inventory management.1 So if you want to stay competitive in today’s business world, it’s time to make the switch from pen and paper to real-time, cloud-based inventory management software. Navigating through different inventory management software can be a tedious process. To help you save a little time, we’ve researched different options and collected what we think are the top five inventory management systems for small businesses. The highlight of this system, however, is its cloud-based host of tools, particularly its hands-free drop-shipping management—which makes it easy to have goods sent directly to the customer from the manufacturer. Once you’ve set up your products and vendors, you can either manually or automatically route each assigned product to the correct drop-shipper. Ordoro also gives you the option to take orders with multiple products and separate the drop-shipped SKUs (stock-keeping units). If your business needs drop-shipping, SKUs, RFID (radio-frequency identification) kitting, and business analytics, we recommend one of Ordoro’s three professional packages. Its basic plans are perfect for businesses that only need shipping capabilities. Ordoro’s free plan is offered to single users with a maximum of 50 orders per month. Zoho Inventory is our pick for runner-up because of its efficient multi-channel selling and powerful inventory control for a small business. As one of our front-runners, Cin7 connects e-commerce, POS systems, warehouses, Electronic Data Interchange (EDI), and third-party logistics (3PL) together to create a comprehensive business system. What makes Cin7 stand out, however, is its vast knowledge base with its expert articles and videos detailing its in-depth features. In addition, Cin7’s in-house experts will guide you through setup. After which, you’ll have a dedicated account manager at your disposal. Cin7’s packages, which start at $299 per month, cater to businesses of all sizes, from start-ups all the way to enterprises. Get started by requesting a free demo. SOS Inventory’s user guide, informative how-to walk-throughs, and 24/7 customer support is enough for us to name it runner-up for best customer service. Developed by Fishbowl, Boxstorm is our runner-up choice for QuickBooks users who need warehouse management with seamless QuickBooks integration. We named Veeqo most user-friendly because of its minimalism, easy navigation, and fast load times. Its slick dashboard allows users to toggle between sales, profits, and returns. The dashboard also has a wide breadth of stats, including total orders, total revenue, average order value, and average shipments per day. Businesses can also automatically sync inventory across every store, which means you’ll never oversell. Veeqo helps you organize multiple warehouses and kits and bundles with inventory histories and other features. And if you’re working with foreign currency, Veeqo will automatically convert orders into your base currency using real-time exchange rates. Veeqo offers four pricing tiers that suit different business types and sizes. Plus, like most subscription services, you receive a discount if you choose annual billing over monthly. If you’re not sold on Veeqo, opt for its 14-day free trial. If you’re looking for a user-friendly inventory management solution that’s more affordable, consider TradeGecko’s straightforward Lite plan for $79 per month. But before committing to a plan, take advantage of their 14-day trial. If you’re looking for an inventory management tool with lightspeed retail power and intensity, look to Unleashed. It stands out from the rest of our reviewed software due to its extensive features. This serious inventory software caters to larger businesses with multiple warehouses and extensive product lines. Businesses will have real-time access to stock levels, costs, and tracking information. The Small package ($85 per month) covers one user and one warehouse while the Medium package ($165 per month) is for three users and unlimited warehouses. If you need more in-depth features, move up to their Large package ($329 per month) or Large Plus package ($579 per month). Stitch Labs comes in a close second due to its ability to track inventory across multiple channels, POS systems, and warehouses, which makes it easier to scale your business. There are four inFlow packages. The free edition is recommended for start-ups and small businesses. If you’re in need of kitting and customization, upgrade to the paid packages. Users can save $120 or more per year if they pay annually. Considered a traditional and safe choice, inFlow provides small businesses with a basic and effective set of tools for managing inventory. Using inFlow slashes sales costs significantly, which results in a higher ROI. As an added bonus, Genius Projects offers a software development kit that allows your IT team to create custom features. Although it offers an array of features, its complicated interface may take some time to master. Unfortunately, there is no available price overview on their website. To get a price, you must enter your contact information and wait for them to get in touch with you. Is there something about the management of inventory items we haven’t covered? Here are some answers to the most frequently asked questions. What is inventory management, and how can it help? Inventory management is the process of ordering, storing, and controlling a company’s raw materials and finished products. Cash flow and inventory tracking can be a challenge if you don’t have the proper tools. Unfortunately, spreadsheets can’t handle the demands of real-time data and inventory management. 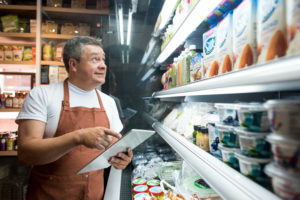 Inventory management software can forecast demand, prevent product overstock, eliminate shrinkage concerns, increase productivity, and cut costs. Friendly tip: You can learn more about how inventory system software reduces costs for you and your customers with our nifty guide. You’re welcome. When do you need inventory management software? If you’re monitoring inventory levels of multiple stores and online sales channels, consider investing in an inventory management system. The right software will provide insights that help you make faster and better business decisions. You can see real-time inventory data, making it easier to manage new purchase orders and see what you have on hand in the store and in the warehouse. Most services offer a mobile app, making things that much easier. The FIFO method, which stands for “first-in, first-out,” is one way to calculate the cost of goods sold. This inventory costing approach works off the idea that the items placed in the inventory first are sold first. The last-in, first-out method (LIFO) is the opposite of the FIFO approach. Supply chain management (SCM) is an important aspect of business processes. SCM professionals gain a competitive edge by building and delivering products faster and cheaper. It involves the movement and storage of raw materials and finished goods from point of origin to point of consumption. In addition to managing product, supply chain management also manages data, time, and money. This allows small businesses to make decisions more quickly and more accurately when it comes to their inventory. What are the benefits of integrating a POS system with inventory management software? A point-of-sale (POS) system is used to make transactions, record sales, and track inventory. Rather than having to manually enter inventory counts, a POS system will automatically update it for you. Can a free inventory management system provide enough support? Fortunately, you don’t need to break the bank to keep an eye on your inventory. There are several free inventory management solutions for small businesses. However, you may miss out on advanced user features and options. If you need something more robust to scale your business, we recommend upgrading to paid packages. What is product life-cycle management? Managing a product’s life cycle helps business owners understand certain elements of the product at particular points in time. The main stages of the product cycle are introduction, growth, maturity, and decline. What hardware is commonly used for inventory management? What are common terms in inventory management? Bill of materials: A bill of materials is a list of raw materials, subassemblies, and components with the quantities of each. Just-in-time inventory (JIT): Also known as lean manufacturing, just-in-time inventory management is the process of ordering and receiving inventory for production and customer sales as it’s needed. Although JIT management can cut costs and improve your return on investment, it can lead to stockouts (or times when an item is out of stock). Drop-ship: Drop-shipping allows retailers to sell products without actually stocking the items. When a customer places an order, the retailer fulfills the order by buying the product directly from the manufacturer and shipping it to the customer. Amazon is perhaps the largest drop-shipper. To learn more terms, take a look at our overview of inventory management acronyms. Should I use a perpetual or a periodic inventory system? The perpetual system alerts retailers when product amounts are low, and in some cases, it can automatically reorder products. A periodic inventory system is a non-continuous manual process for tracking sales. Although the perpetual system is more popular, periodic inventory costs are minimal. However, business owners can also benefit by employing both perpetual and periodic inventory systems. Overall, the affordable and functional Ordoro is our pick for the best inventory management software for small businesses. However, every business has different needs. So shop around until you find your ideal inventory management software. Do you have a different inventory management software that works for you? Let us know in the comments below! What about the best cloud inventory management software? That’s where Kechie has these guys beat. https://www.capterra.com/p/163480/Kechie/ to check out their reviews!